Babyologists, it’s party time! After sifting through dozens of wonderful children’s parties, we’re thrilled to showcase our very first reader party for you. Say happy birthday to little Sydneysider Austin. 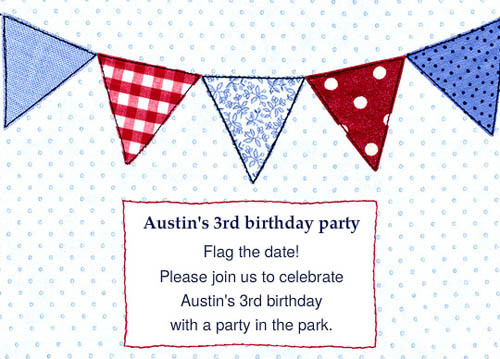 We couldn’t help but be impressed with the bunting-themed party in the park that his mum Bronwyn threw to celebrate Austin’s third birthday recently. So simple, so creative, yet so completely, utterly stylish. Keep on reading as Bronwyn shares how she did it. I’m lucky enough to own a bouncy castle and we have friends with another. So, small children, big park, two bouncy castles… party made! Just a small matter of bringing it all together. My starting point was the fabulous buntings at Hip Hooray, brought to my attention here on Babyology. Then I found an emailable invitation on Pingg that matched the theme – Flag the Date!, get it? I like the idea of email invitations as they go directly to the people you want to invite, they can’t be lost and there are automatic reminders and thank-you’s. Also, since my eldest son started school I’ve noticed the “politics” of giving out paper invitations in the schoolyard – it’s always going to make someone feel left out. Email is much more discreet. Next I found some handmade fabric bunting that I couldn’t resist. Sally of Tiddalids has a fabulous eye for colour and combining fabrics, and designed a bunting to match my invitations. 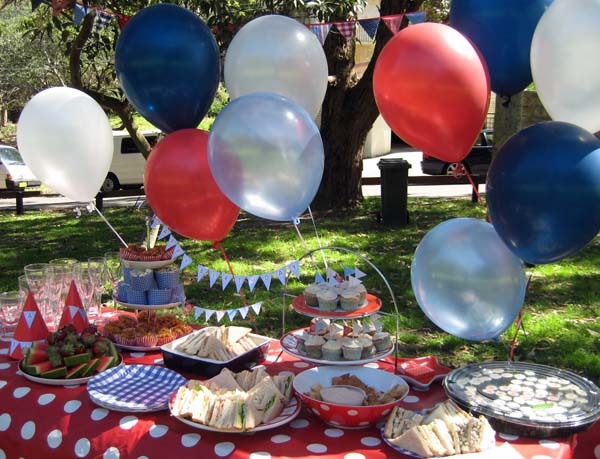 A tip on bunting – no matter how many metres you get, it will never be as much as you need! Some printable cake bunting that I found here and here matched in perfectly (who knew there was such a thing as cake bunting?). 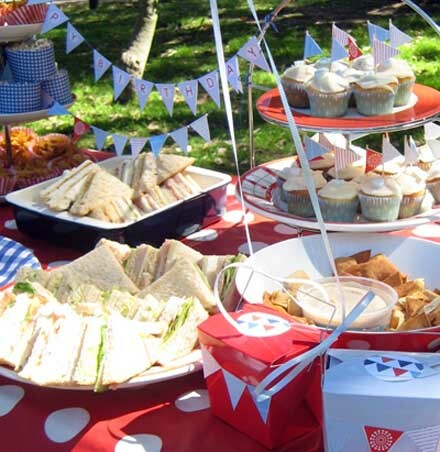 I strung the mini bunting together to decorate the table, used it as little flags for the cupcakes and glued it on the favour boxes and party hats. After that it was just a case of keeping my eyes open for other bits and pieces to fit in. Party hats and noodle boxes for the favours were from Spotlight. These were decorated with the cake bunting too. Paper plates were a surprise – Woolworths home brand! Paper patty pans for little cakes, honey joys and individual shares of popcorn (much better than lots of kids putting their hands into a big bowl!) were from Iced Affair in Camperdown and Kitchen Kapers in Crows Nest, Sydney. Mooo had a bunting design for personalised stationary which I ordered for thank you cards and to seal the noodle boxes. The tablecloth was a piece of fabric from Ikea and the plates, bowls and stands were my own. We didn’t have a birthday cake on the day. We had a family celebration the week before where I made a cake and I just wasn’t up for another one on the day! We had the little cakes instead – each one decorated with a sugar heart. As for any special effort on the day, after being up and down ladders hanging bunting, running food and decorations across the street, dragging out bouncy castles and setting them up and organising power for the bouncy castles… I was quite content for the little ones to just bounce their hearts out! 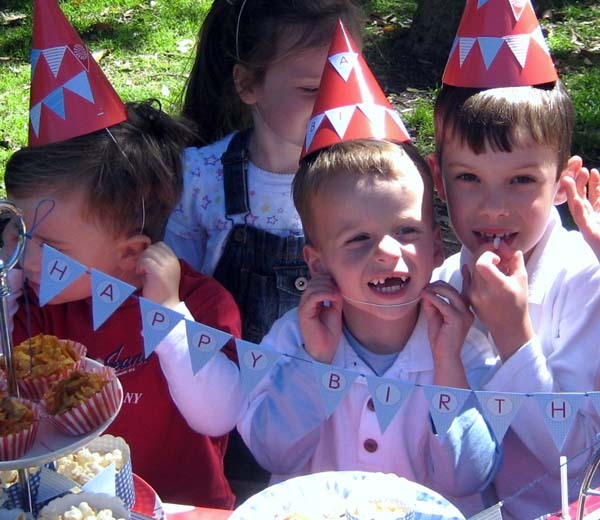 That’s my birthday boy below with the missing front teeth. He’s not an early developer – he knocked them out on our front steps. Sigh.